A Windows profile is a set of files that contains all settings of a user including per-user configuration files and registry settings. 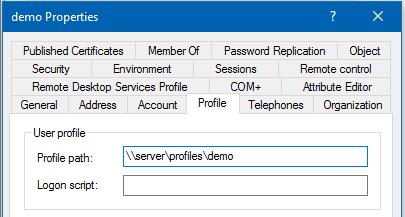 In an Active Directory or NT4 domain you can set that the profile of a user is stored on a server. This enables the user to log on to different Windows domain members and use the same settings. When using roaming user profiles, a copy of the profile is downloaded from the server to the Windows domain member when a user logs into. Until the user logs out, all settings are stored and updated in the local copy. During the log out, the profile is uploaded to the server. Depending on the operating system version, Windows uses separate profile folders for a user to support Windows version-specific features. Version 2 profiles and later append the .V* suffix to the user's profile folder. * Using the default settings, Windows 8.1 and Windows Server 2012 R2 use V3 profiles. However, the profiles are incompatible with Windows 8.0 and Windows Server 2012. For this reason it is recommended that you configure Windows 8.1 and Windows Server 2012 R2 to use V4 profiles. For further details, see: Incompatibility between Windows 8.1 roaming user profiles and those in earlier versions of Windows. * You can alternatively set other groups, to enable the group members to store their user profile on the share. When using different groups, apply the permissions as displayed for Domain Users in the previous example. ** For details, see The SYSTEM Account. Verify that permission inheritance is disabled on the root of the share. If any permission entry in the Advanced Security Settings window displays a path in the Inherited from column, click the Disable inheritance button. On Windows 7, unselect the Include inheritable permissions from this object's parent check box to set the same setting. These settings enable members of the Domain Users group to store their roaming profiles on the share, without being able to access other user's profiles. Members of the Domain Admins group are able to access all directories on the share. On a Unix domain member server, you can set up the profiles share using POSIX ACLs instead of using Windows access control lists (ACL). This will not work on a Samba Active Directory Controller. When setting up the share on a Samba Active Directory (AD) domain controller (DC), you cannot use POSIX ACLs. On an Samba DC, only shares using extended ACLs are supported. For further details, see Enable Extended ACL Support in the smb.conf File. 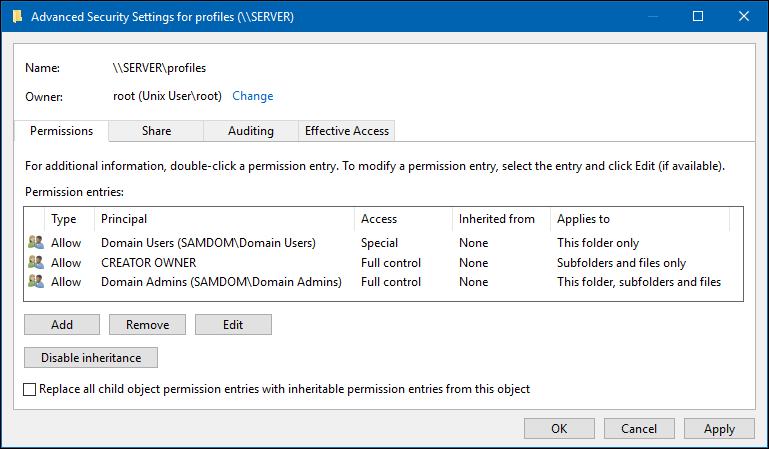 To set up the share on a Samba AD DC, see Setting up the Profiles Share on the Samba File Server - Using Windows ACLs. For details about the parameters used, see the descriptions in the smb.conf(5) man page. These settings enable members of the Domain Users group to store their roaming profiles on the share, without being able to access other user's profiles. Alternatively, you can set a different group. For further details, see The Windows Roaming Profile Versions. Note that you must not set a trailing backslash. In an Active Directory, you can use the Active Directory Users and Computers Windows application to set the path to the user's profile folder. If you do not have the Remote Server Administration Tools (RSAT) installed, see Installing RSAT. Log in to a computer using an account that is enabled to edit user accounts. Open the Active Directory Users and Computers application. Navigate to the directory container that contains the demo account. Right-click to the demo user account and select Properties. Fill the path to the home folder into the Profile path field. Set the path always without any profile version suffix and without trailing backslash. For details, see The Windows Roaming Profile Versions. The setting is applied the next time the user logs in. Using group policy objects (GPO), you can assign settings to organizational units (OU) or to a domain. This enables you, for example, to automatically assign profile paths to all users that log on to a computer that is a member of the OU or domain. If you move the computer to a different OU or domain, the setting is removed or updated. Using this way, you do not have to assign manually the settings to each user account. Windows only supports assigning a profile path using GPOs on a per-computer basis. This means that the path is also applied to local users on domain members, which have no access to the profile share. To set the profile path on a per-user basis, see Using Active Directory Users and Computers. Log in to a computer using an account that is allowed to edit group policies, such as the AD domain Administrator account. Enter a name for the GPO, such as Profiles on server. The new GPO is shown below the domain entry. Navigate to the Computer Configuration → Policies → Administrative Templates → System → User Profiles entry. Windows replaces the %USERNAME% variable with the user name during login. Set the path without trailing backslash. Close the Group Policy Management Editor. The GPOs are automatically saved on the Sysvol share on the domain controller (DC). The GPO is applied at the next reboot of the Windows domain members or when they reload the group policies. You must not set a trailing backslash to the path. During logging in to the domain member, Samba automatically replaces the %U variable with the session user name. For further details, see the Variable Substitutions section in the smb.conf(5) man page. See Configuring Windows Profile Folder Redirections. This page was last modified on 4 December 2018, at 09:31. This page has been accessed 128,497 times.